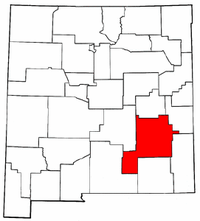 Roswell is a city in, and the county seat of, Chaves County in the southeastern quarter of the state of New Mexico, United States. The population was 48,366 at the 2010 census. It is a center for irrigation farming, dairying, ranching, manufacturing, distribution, and petroleum production. It is also the home of New Mexico Military Institute (NMMI), founded in 1891. Bitter Lake National Wildlife Refuge is located a few miles northeast of the city on the Pecos River. Bottomless Lakes State Park is located twelve miles east of Roswell on US 380. Roswell is most popularly known for having its name attached to what is now called the 1947 Roswell UFO incident, even though the crash site of the alleged UFO was some 75 miles from Roswell and closer to Corona. The investigation and debris recovery was handled by the local Roswell Army Air Field. about 40 Miles NW of Artesia.